With the success of “Missing You,” it would be a lie to say K-pop fans aren’t eager for the BtoB’s comeback. “Missing You” was composed and produced by the group’s own member, Hyun-sik, who has since been gaining attention for his song-writing abilities. The title track to their newest album, “Only One For Me,” shines the spotlight on the group’s talents, and on Hyun-sik’s compositional abilities. Unlike the melancholy of “Missing You” released last fall, “Only One For Me” is a refreshing take on summer. Summer often brings to mind booming dance tracks and pumping beats. The ballad group, however, does not attempt a huge leap in music styles just to suit the seasonal change. “Only One For Me” is bright but not overwhelming, making it a pop ballad comfortable to groove to. The group’s focus on lightening up the atmosphere is evident in the MV, dazzling with its sunny backdrops. The MV begins with the members in a dimly lit hotel room, dressed to the nines in suits. The bright sunlight sneaks in only in the briefest moments. But be assured, this gloomy backdrop lasts for less than a verse. Min-hyuk closes his eyes and lies back, only to be teleported into a sunlit new setting when he reopens his eyes. This shift reflects the very desire to be taken out of gloominess unsuited for Summer, as well as the group’s invitation for listeners to head out and embrace the sun. Even the alternative setting, that of the group chilling at the back of a vehicle at night, carries the same uplifting vibes with it. The vehicle is decorated with lights as the members enjoy the company of each other. The night breeze is in their faces, making me wish I could hop on and party with them. 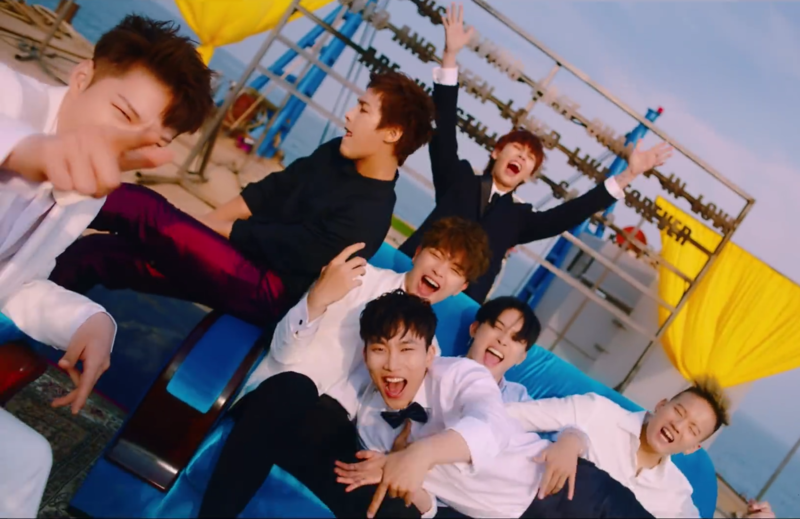 Thinking of hot Summer nights might be a major turn off, but BtoB shows us how to have fun despite the weather. After all, there is no better time than Summer to take a drive in a roofless car. T he song interestingly balances the groovier rap parts with its tenderer melody as well. The rap lyrics themselves are not complex, though they do incorporate some clever wordplay and rhythm. An all-around cheerful song, it is hard to resist smiling while watching the MV. Falling in with BtoB’s usual style, this pop ballad is an easy listen without being too burdensome. It promises a good groove without pushing listeners to jump about. Not exactly an EDM party tune, it offers a different image of Summer. “Only One For Me” takes on a light-hearted tone, making it a loveable tune worth multiple listens. Towards the end, the song switches to Chang-sub’s emotional bridge before pushing towards an upbeat melody again. The group gathers for the song’s close, chorusing together once again. They are seen having fun on the floating set, but this time it is nightfall. The sign in the backdrop has been lit on fire, livening up the darkening horizon. Somehow, the dynamism and teamwork between the members are made clear even in this simple MV. They laugh and fool around, but none of it seems staged. The element of joy they wish to convey is felt by simply watching them have a genuinely good time. Hyun-sik deserves to be applauded for taking on the task of composing “Only One For Me.” A title track is a huge burden, considering it represents the outlook of an entire album – success rests largely on an album’s title track. It is a wonder that such an upbeat track places itself at a midpoint between conveying excitement and a more laidback vibe. Somehow, this balancing act makes it a perfect fit for the ballad group. “Only One For Me” picks off where “Missing You” left off, allowing the group to showcase their talents without losing personality. Arguably, perhaps Hyun-sik, as part of the group, is the one in the best position to create a track unique to BtoB’s character. It has been 6 years since BtoB’s debut, with the group fluttering in and out of the spotlight. They gained the attention they deserve with “Missing You” sweeping the charts. But no success is ever certain in the K-pop scene. One hit wonders are numerous, and it is an arduous task trying to produce hits. Yet, Btob seems to be refuting such an image. The group certainly has talent and they seem to have finally found an opening to shine.